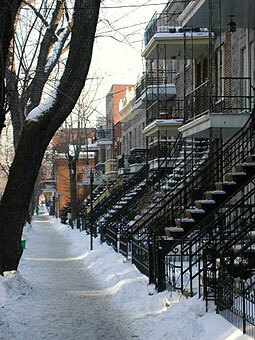 Montreal Heritage Staircases - RDC inc.
Montreal, with all of its history, culture and beautiful geographic location is a unique city with a lot of appeal. For more than a hundred years and a half, Montreal has been the main industrial and economic center of Canada and in that same time period have developped its own style, architecture, buildings with all kinds of carvings and decorative ornments and beautiful corniches. 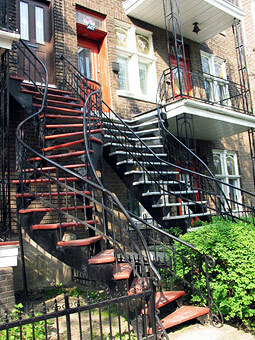 All stairs, projections, corniches and corbels that you see on buildings, homes and apartments in the busy streets of Montreal have a variety of colors, styles and forms that appeals to the eyes and give a distinve look that contribute to the city's rich heritage. All the appeal given by those decorative features and ornments on your house, apartment or building deserve to be preserved through time unchanged from its original form and that any renovation or restauration project be done in respect of the original skilled tradesman who designed it. In order to keep your building's original, historic (and sometime a hundred years old or more) look and to keep its resale value high for years to come, it is very important to give all your restauration and renovation to professionnals who will know how to recreate the the original manufacturing techniques with new, more durable materials and finishes. 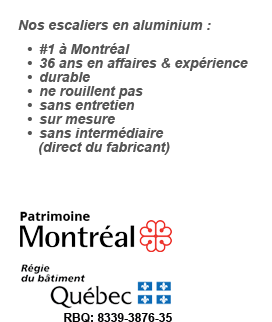 Rénovation Daniel Chantal Inc. specialize in the manufacturing of custom made welded aluminium stairs that follows all of Montreal city heritage standards and other laws. We offer you innovative products made of alumimium and painted with special electrostatic paint that last a lot longer than conventionaly made and painted iron stairs. Wheter you have a straight run stair, a "L" type stair, a circular or spiral stair, leave the hard work to our qualified staff that will make a pleasure of building your stair project that will last for long time to come! Contact use for a free quote of your exterior home renovation projects: aluminium stairs and stair railings, spiral stairs, fiberglass balconies and steps, etc.